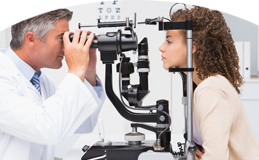 Desert Vista Eye Services offer diagnosis and treatment for many vision-related issues. Their extensive knowledge and experience are the cornerstones for providing the most comprehensive vision care in the valley. Cataract eye surgery involves removing the natural lens of the eye that contains the cataract. The lens can then be replaced with an artificial lens called an intraocular lens implant (IOL), or it can be left out and contact lenses, or rarely eyeglasses, can compensate for its absence. The procedure takes about five to ten minutes under eyedrop anesthesia and light intravenous sedation. Blood thinners do not need to be stopped prior to surgery. Since cataract eye surgery is an outpatient procedure, you may go home within an hour after surgery. Most patients return to work or school after resting one to two days. Avoid rubbing your eye for one month. Avoid sand, hot tubs, saunas, swimming and gardening for one week. Otherwise, in most cases, you may resume full normal activity the day after surgery. You can bend, stoop and lift. Please ask us about any other specific activities. A scratchy sensation can usually be relieved with artificial teardrops while the incision heals. A slightly red eye and mild lid swelling may occur and resolve after a week. Use Tylenol or Motrin to relieve a mild dull ache for the first few days. About three to four weeks after surgery, the eye is mostly healed and your eyeglasses prescription may be changed. Your vision may be blurry during this recovery period until the new glasses are prescribed. You may remove the lens from your glasses until you obtain your final prescription. Glaucoma is a group of eye diseases in which a specific pattern of damage to the optic nerve results in loss of eyesight. At first, the person loses their peripheral vision. Without glaucoma treatment, vision loss may continue, leading to total blindness over time. Glaucoma is usually treated with medications, though laser treatment or surgery is often needed. Refractive surgery attempts to correct nearsightedness by changing the shape of the cornea. The goal of refractive surgery is to allow people who are nearsighted to see clearly without corrective lenses or to be less dependent on corrective lenses. Ask us about the exciting option of refractive surgery. If you are a candidate, you may reduce or eliminate your need for glasses after surgery. Approximately 80% to 90% of our patients who choose refractive surgery never wear glasses! The goal of LASIK eye surgery is to reduce your dependence on corrective lenses. Using the excimer laser, we reshape the cornea to conform to your glasses or contact lens prescription, thereby reducing or eliminating a lifetime of dependence on corrective lenses. LASIK surgery cannot correct a condition known as presbyopia, or aging of the eye. This normally occurs around age 40 and may require the use of reading glasses. In fact, people over 40 who have their distance vision improved with LASIK surgery may find that they still need reading glasses after the procedure. 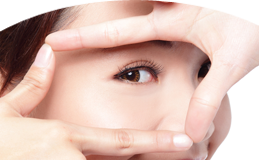 The ideal candidate for LASIK surgery is over 21 and has healthy corneas. Candidates must not have had a significant increase in their prescription in the last 12 months. It takes only seconds to treat a lifetime of nearsightedness, farsightedness and astigmatism. Find out if you are a candidate for this life-changing procedure by calling 480-507-0600 and scheduling a FREE LASIK consult with Dr. Lawrence Kahn. It may be necessary to dilate your eyes during your eye exam or treatment. Dilation results in light sensitivity and an inability to see clearly for a few hours. We provide free disposable sunglasses or sunglass inserts. Patients should wear sunglasses outdoors and be cautious when walking and going up and down stairs. We recommend that you not drive or operate dangerous machinery immediately after dilation. We also recommend that someone accompany you to your appointment to drive you home or that you wait until your eyes return to normal so that you can drive safely. Your eye care begins with a comprehensive vision examination. In this examination, Dr. Kahn and Dr. Eason look for evidence of eye diseases such as glaucoma and cataracts, vision conditions such as nearsightedness and farsightedness and health problems such as diabetic retinopathy and hypertension. It may be necessary to dilate your eyes during this examination. The refraction is the part of the eye exam that determines your best-corrected vision and if you need corrective eyeglasses. It is an essential part of an eye exam and necessary to write a prescription for eyeglasses. Refraction may NOT be covered by your insurance plans, including Medicare. These plans consider refraction a "vision" rather than a "medical" service. We collect this fee at the time of service in addition to any co-payment or co-insurance your insurance plan may require. If your insurance pays for refraction, we will reimburse you accordingly. We offer a large selection of fashionable eyewear. We carry eyeglass frames such as Vogue, Kate Spade, Maui Jim, Rudy Project, Cazal and Ray Ban as well as many other name brands. We DO NOT perform contact lens examinations or write prescriptions for contacts. Discover experienced eye care services at Desert Vista Eye Specialists. Call 480.507.0600 or use the convenient Request an Appointment form.